I’ve been thinking of finishing a first batch of miniatures and start using them for playing in small battles of about 500 points, mainly because it’s going to take me a looong time to finish painting 1.500 points of eldar, and I think I can have those first 500 points finished before Christmas – or during Christmas holidays the latest. - Eldar guardians (10) with brightlance grav platform. This unit includes a warlock with witch blade and the embolden psychic power. 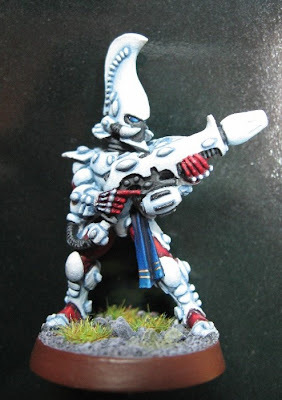 - Eldar storm guardians (10), with a flamer and a fusion gun (the special weapons included in the boxed set). This unit includes a warlock with singing spear and the enhance psychic power. Fritz, from the Way of Saim-Hann blog, has started a painting contest focused on a jetbike mounted eldar HQ. Apart from applauding his initiative (great idea man!) I haven’t been able to do much more, being my painting schedule so tight currently. The entries for this contest are very original indeed, and there are several good paintjobs there too. Check it and vote your favourite! Briefing: this post is quite long, and deals about playing with tyranids, currently my main army; so no eldars today, sorry. Nevertheless, if you want to get some gaming tips to use with or against these bugs, you are welcome to keep reading :) And of course, if anybody has a comment or suggestion, is also very welcome to write it down. Last Monday I went to my local GW store, where I had to play a game against one of its friendly red shirts. Where I live, games are usually played on a 2.000 point basis, but for this time we agreed on playing a 1.500 points battle. Why? Well, basically two reasons: first, I’ve lately realized that playing against 2.000 points of nids (my army) means a battle of no less than 3 hours, including deployment and that stuff. I suppose that’s normal when you have an army of around 100 miniatures; I wonder how long will it take me to play a “Green Tide” ork player… but I’m sure it will undoubtedly be very funny! The second reason is the organization of our imminent inter-store championship; where gamers of all my area will be competing for several months, each one defending one gaming store of my county; and all the battles must have a maximum of 1.500 points per side, so this was an excellent occasion to make trials with different army lists. I always play with the same army, more or less. It is composed by the minis I’ve got with the passing of the years, from different presents such as battleforces, plastic boxes and so on; so I have to stick to those minis I have, and I can’t make big variations in my army list. That’s not a problem, because these minis are the ones I like most (gaunts, carnifexes and warriors mainly), and are mainly made of my favourite wargaming component: plastic. So then I ran an army with a close combat Hive Tyrant with two tyranid guards (which to date have simply eaten everything that has crossed their path – including a C’tan), and an infiltrating Broodlord with a retinue of 11 genestealers. Fire support was provided by a unit of six warriors with deathspitters, two zoanthropes with warp blast and two Carnifexes with barbed stranglers. Basic units were sixty gaunts (half termagaunts, half spinegaunts) in six units of ten, whose mission was seizing objectives. My opponent played Dark Angels, and had four squads of five marines, one five-man squad of the Deathwing, a Land Raider Crusader, a Whirlwind, a Demolisher and a Venerable Dreadnought, all commanded by Belial. Mission played was “Seize Ground” with four objective markers, with the “Pitched Battle” deployment. I won the roll for starting the game, so I deployed first. Everything was in cover (just in case he stole me the initiative and got first turn), but the broodlord, who was in reserve to outflank the enemy. My enemy did more or less the same. First couple of turns were excellent for the nids, thanks mainly to the new rules on templates, and in my very first turn I killed 7 space marines just shooting with the warriors (five small s6 templates and a big s4 one are nothing to laugh at) and the carnifexes (adding another two big s8 templates). I call that tactic “wound saturation”, ‘cause even the finest power armour of the galaxy can’t protect all your soldiers when the enemy causes more than twenty wounds to your units in a single shooting round. That tactic is now even better, due to the new rules on wounds allocation, and a couple heavy/special weapons were lost for the marines (nice!). My opponent was surprised of this firing power – he wasn’t expecting that from the nids – and we changed roles; he advancing towards my fire line whereas I was re-deploying my troops and firing at him. 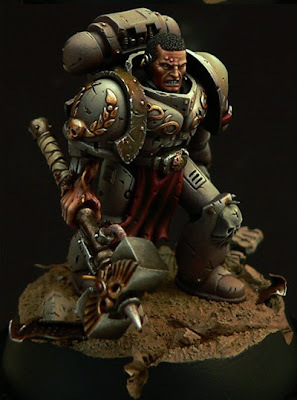 The only unit of my army that advanced forward like a furious juggernaut was the Tyrant and his retinue, managing to kill a unit of marines and destroying the Dreadnought before blowing up in a cloud of ichor and dribble when the Demolisher got a direct hit on them. It was not a problem, because their work was done; they diverted most of my enemy’s firepower – and I must say that it was hilarious when he managed to get two wounds on the tyrant firing just bolters – and destroying part of the marine’s army (at the end we made some calculations, and realised that the big guy had paid his points back – wooo!!). On the other side of the board, the broodlord advanced relentlessly towards the enemy, under a rain of fire that was wiping genestealers from his retinue very, very fast. On the other hand, the Deathwing squad advanced towards one of the objectives no matter the rain of fire falling on them. Albeit I left the unit very, very weakened – leaving just a lightning claws terminator and Belial himself – this couple managed to open a bloody path through three units of gaunts (killing one every turn) and a zoanthrope, and there they stood claiming an objective (Belial’s special rule allows him to pick terminators as core units, being able then to hold objectives)… until the warriors shot them and killed the last termie of the unit. After seven turns, my opponent only had the Demolisher and a wounded Belial remaining, while I was controlling two objectives. Great victory for my bugs! As a conclusion of the battle, I must admit that the few games I had played before under the new 5th ed. Rules had served me well in tactical terms; thanks to what I’ve learned from them I knew well how to time my movements, and for the first time in years I had a real tactical plan with my army, instead of just deploying and advancing wildly towards the enemy. New template rules are terrific with some troops, and the tyranid warriors were claimed “unit of the game”, killing in total 10 space marines and the last scoring termie (the one mentioned above), and even wounding Belial himself, just with shoots and more shoots; and providing the synapse necessary to allow my gaunts to hold two objectives; having lost just two members out of six. Amazing performance! The Broodlord was also terribly effective when it reached combat; now the feeder tendrils allow you to repeat all failed rolls to hit and that rule is terrific! The Hive Tyrant was also good, a close combat behemoth as always, although he was dead for turn three; and the Carnifexes also did an excellent job. Nice! Next game I’ll make a “small” adjustment to this army list, dropping from eleven to six the retinue of the Broodlord and reducing the squad size of the warriors to five, to count with some more punch… in the form of a Dakkafex, a Carnifex with two twin-linked devourers. Cool!! Although I’ve decided to stick to non-vivid colours when painting my eldars, sometimes I simply can’t help making changes on the way (and that’s something applicable to every aspect of my life). Thus, I’ve devised a good painting scheme of blues & bones for the core of the army (that means guardians and vehicles), but now I can’t think of applying the same concept for the specialist warriors, who are different and peculiar troops (“special(ist)” troops we could say). It also must be said that sometimes I suffer from a weird disease called “painters' fever”, whose effects are hallucinations with different sizes of brushes and pots of paints mixed, coupled with the imperious urge to capture all these ideas on a mini. The combination of all those ideas was the decision of painting my specialist warriors breaking the main colour scheme of the army, and also trying something different with them, something even daring, both in their colour scheme and in the technique used. First specialist warriors I decided to paint were the fire dragons (because the minis are just so cool). Well, I haven’t painted all of them, just one; but that’s because that’s the way I usually do things when experimenting with colour schemes, and only once I’m pleased with the results obtained (usually after a lot of that on-the-way changes) I start with my standard “painting line”. They look very nice, don’t they? 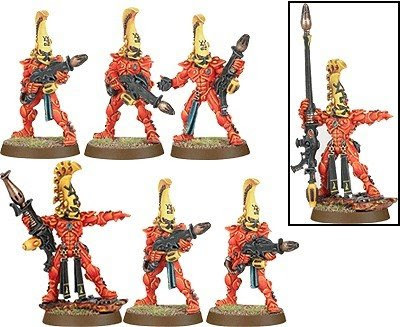 Bright and hot colours, fitting very well to their “flame-ish” background and their “melta” role and weapons. But… there is something missing here… there is no contrast between the undersuit and the reinforcement plates, and although that’s not a problem with darker colour schemes (such as dark reaper’s ones), I don’t like it for brighter colours, so… what to do? Well, first, choice of colours. After some minutes of thinking, I decided to stick to a limited palette of two main colours, a contrast colour and an extra neutral colour for some parts. Thus, I decided for dark red and blue-ish white for the main colours (undersuit and reinforcement plates, respectively), with dark grey (almost black) as the neutral colour, and some dots of blue for the contrast on details. While black and blue are easy colours to paint, and I’ve recently mastered (more or less) a red-painting technique of my own recipe, white is a colour that demands a lot of work and is very difficult to paint properly, but if painted carefully can lead to excellent results. I also went for a grey basecoat, the one I favour lately above the rest just because I’ve achieving very good results with it. And after a few hours of trying different combinations, the mini was finished. I’m really pleased on how it turned out. 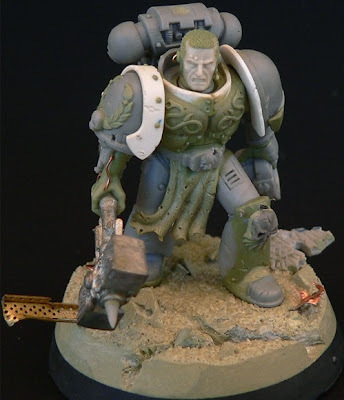 The picture is not good at all, I’m sorry; I’ll try to shoot better ones once I finish making my light box – based on this excellent article – but shows quite well the idea I’ve trying to carry out: a contrast nice to the eye, and a different scheme for a miniature. This result reminds me somehow of the Star Wars stormtroopers hehe; with the undersuit black instead of red he could be one of Lord Vader’s personal guards. I attempted some OSL in the mouth of the weapon, but didn’t turn out well, so I dropped it for a simple glowing effect like the one you can see on Warmachine miniatures (this is difficult to see in the picture due to light reflection, hope to solve it someday). I also like the eye very much (I admit that I’ve been veeery lucky with its result), and also the blue ribbon hanging from his waist; the two stripes it shows are being used as a technique of “troop integration” and are being painted on very infantry miniature of the army, in different places and colours (see eldar guardians soon). A couple of weeks ago was hold the main and most popular of all Games Days around the world, the UK GD. Crowded with thousands of people, from dedicated gamers to master-crafted painters; and full of all types of Games Workshop imagery, to an extend never seen before, and blah, blah, blah. Well, at least that’s what my friends have told me, since I didn’t have the chance to attend the event. What they’ve told me is that it has nothing to do with any other games Day they’ve seen (and that means many), this one being much bigger and crowded than the rest. I suppose that the fact of being at its home place has something to do with it. But what I can say without any doubt, and I don’t need to go there to make sure myself, is that the Golden Demon Contest hold there is by far the most popular of all, to which people of dozens of different countries travel to show their stunning pieces of art. Every year, some of the best miniature painters of the world gather there and compete to win a Demon Trophy and the UK Slayer Sword, the ultimate prize for a painter of Games Workshop miniatures. And every year we, simple mortals, are presented with some of the most amazing creations anybody can dream of; from exquisitely painted miniatures to scratchbuilt conversions, all of them full with a small spark of that thing some people uses to call magic. This year I’ve seen some really new and interesting jobs, especially in the “Duel” category; where the entries have been really great. May this serve me as inspiration, because I’ve been working in a project for the Golden Demon for over a year… yes, I’m that slow at painting. The Slayer Sword was awarded to Nano, who sculpted and painted a superb Space Marine; congratulations to him and all the winners! I must say that his mini is not exactly my cup of tea, specially the choice of colours; but I admit that his technique is perfect, and the Sword is well deserved. Here there are some pics of the green and the finished piece.